Spring time work at the Lookout Point. Sometimes things just work right and today was one of those days. I got done with my day job early. The weather was nice and the temps were cooler than normal. So I asked my dearest wife, Amy, if she would like to help me do the spring trimming job on the Lookout Point area. She said sure, so tools were loaded in the truck and off we went. First off, was weed eating to see what could be cut down and lopped. Amy started with the loppers behind me making the little bushes go away. After that the chainsaw came out and took care of a few trees. 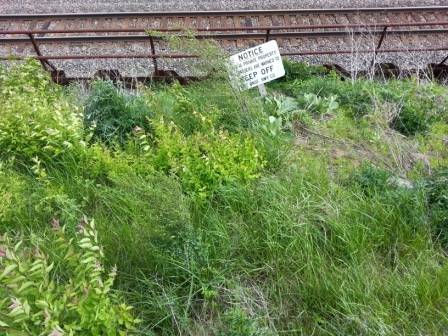 The no tresspassing sign was also reset. 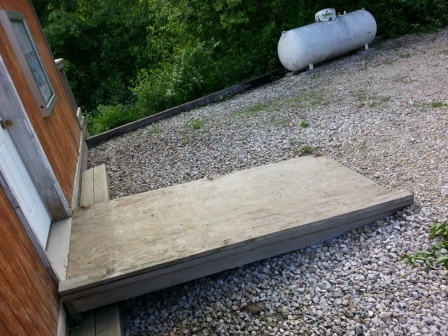 When finished, we were looking at other things to do on another day and found the wooden railing on the ramp was broke, that will be replaced ASAP. (Hopefully this week!) The BBQ grill is also going to be taken out, a replacement will be pending approval due to its lack of use. This is a good idea of everything before we started. 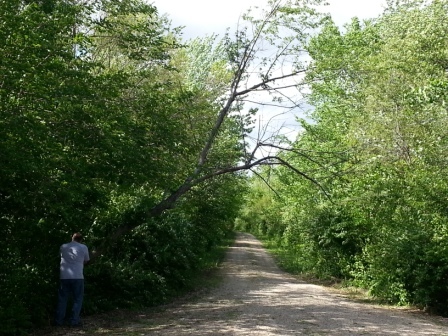 This tree tried to fall this winter but got hung on the old railroad roadbed fill. Mr. Chainsaw took care of the tree. 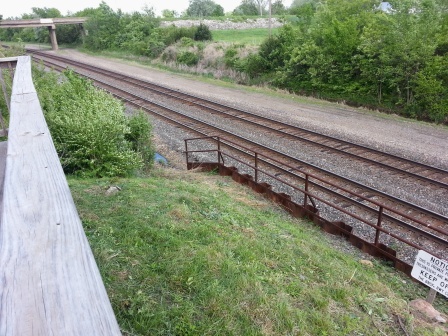 A side note about the Lookout Point: We are still looking to secure donations and/or funding to replace the siding to ensure enjoyment of everyone for many years to come. Your help is much appreciated! !